Originally published by Digital Elephant. 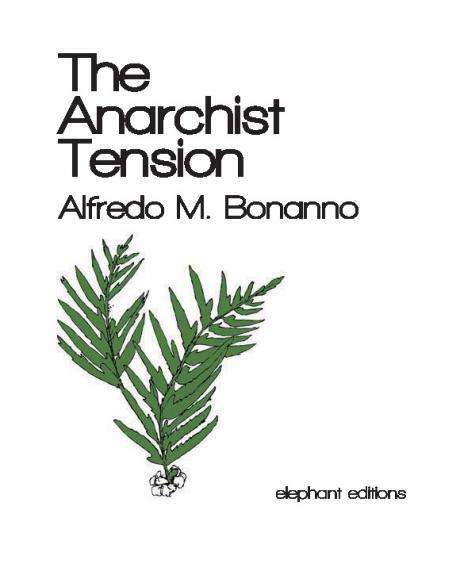 Written by Alfredo M. Bonanno. Translated by Jean Weir. The first of these concepts takes the form of a question: What is anarchism? It might seem strange that I should take up such a problem in this situation as I know for certain that there are many anarchists here, because I know them personally. And if nothing else, anarchists should at least know what anarchism is. Yet it is necessary to take up the questions ‘What is anarchism?’ time and time again. Even in a few words. Why is that? This does not normally happen in other expressions of life, in other activities or thoughts that define themselves with some foundation to be something or other. Today capitalism requires a different kind of person to those it required in the past. Up until recently there was a need for people with professional capacities, a pride in this capacity and particular qualifications. The situation is quite different now. The world of work requires a very modest qualification level whereas qualities that did not exist and were even inconceivable in the past such as flexibility, adaptability, tolerance, the capacity to intervene meetings, etc. are required in their place. This is a millenarian idea. Now that we are reaching the end of the millennium it could take root again. But conditions have changed. This is not reality, it is not this waiting that interests us. What does interest us is another kind of intervention, a far more modest one, but one that is capable of achieving something. As anarchists we are called to do something. We are called by our own individual responsibility and by what we said earlier. From the moment the idea lights up our mind, not the idea of anarchy, but of justice, freedom, when these ideas illuminate our minds and we see the swindle before us—which today more than ever before we could define a democratic swindle —what can we do? We must set to work, and this setting to work also means organising ourselves. It means creating the conditions of reference and relating between anarchists, conditions which must be other than those of the past.